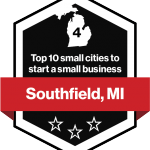 The City of Southfield is the premier business address in Michigan. With more than 27 million square feet of office space and over seven million square feet of retail and industrial space – Southfield is Michigan’s undisputed business center. Looking to expand and/or relocate your office? Call on your Chamber members for assistance! 34975 W. 12 Mile Rd. The below links are some of the most often visited by new and growing businesses in the Southfield Area.